Indoor mold contamination in your Waterford, NJ residential or commercial property should not be taken lightly. Mold is not only unpleasant, but can be very threatening and unsettling. When it comes to mold, MasterTech’s certified team of experts recognize the risks that mold brings to you and your family. That is why we have taken every measure to scrupulously train each of our inspectors and technicians to handle all cases swiftly and efficiently while remaining mindful of you and you family’s safety and best interest. At MasterTech, our specially trained inspectors and technicians work hard to provide the safest and most effective mold removal services possible. We strive to exceed client expectations and industry standards on every job. If you have identified signs of a potentially serious mold contamination in your residential or commercial property, your first step is to consider having a certified mold inspector conduct a Waterford, NJ mold inspection. A professional mold inspection will determine if you have mold, how bad it is, how to properly and effectively get rid of it, and how to prevent the mold from returning. Each MasterTech inspector is properly certified and fully trained to properly conduct thorough mold inspections in Waterford, NJ. Our inspectors are trained to use the safest and most up-to-date equipment and techniques to get to the bottom of your mold problems. At MasterTech, our team is committed to you and your family’s safety and best interest. We emphasize safe and effective mold removal in Waterford, NJ. Our team of industry certified experts have strategically developed a detailed, step-by-step mold remediation process that implements the safest, most effective, and most up-to-date mold removal methods and technologies. Our mold remediation is broken down into 12 detailed and strategic steps to ensure that your Waterford, NJ mold remediation is completed to the highest standard from start to finish. As proof of our commitment to doing the job right, we always complete post verification testing to confirm that the job just done accurately. We also back every mold remediation with a 5-year mold-free warranty. The only safe and effective approach to handling a mold situation is REMOVAL. Be careful not to get lulled into some half-cocked mold “treatment” pitch. 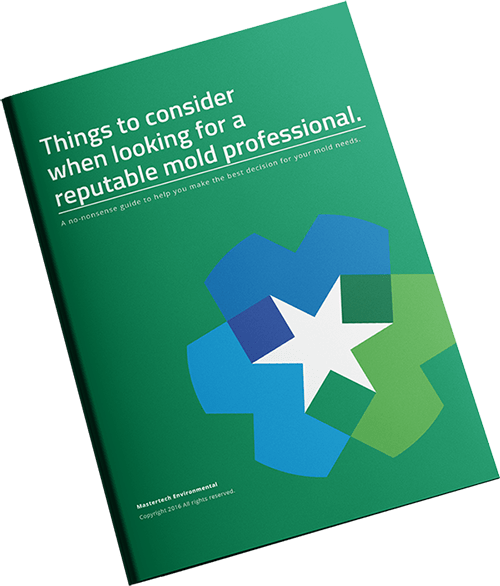 All too frequently, we hear about “professionals” who claim to be able “treat” the mold with one application of this chemical or with one coat of this kind of paint. The reality is that mold “treatment” does not mean removal. Mold roots are embedded deep within porous building materials. If the roots are not actively removed, even if the mold grows dormant and seemingly “dead” or “gone”, it will inevitably return and spread. When it comes to mold remediation and mold removal Waterford NJ, the process is key. There is no cutting corners. 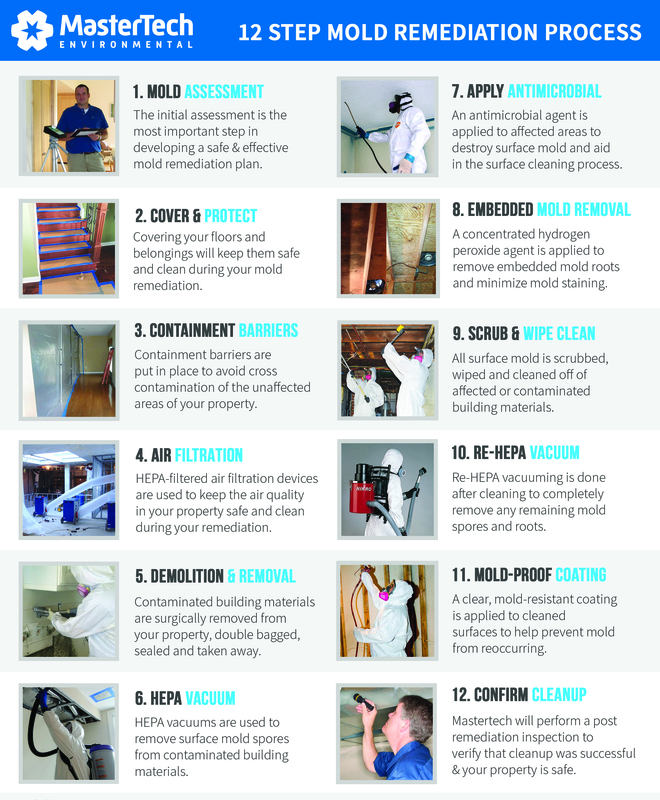 Our mold remediation technicians follow our complete 12-step cleanup process without compromise. This is the only way to ensure that the job is done right the first time. When it comes to mold, an unsuccessful mold remediation can mean potential health risks, additional property damage and a costlier repair. At Mastertech, our mold removal team is committed to completing a safe and effective mold remediation the first time. As proof of that, we back every mold remediation with a 5-year mold removal warranty. Unlike most other service industries, a mold remediation done wrong can affect your family’s health and cause expensive property damage. When it comes to you and your family’s health and safety, the job needs to be done right the first time. It is important that you take the time to thoroughly research your options. You want to be sure to hire the right company that priorities you and your family’s health, safety, and best interest. Do not let symptoms of a mold contamination in your New Jersey home stress you out. If you detect signs of mold growth, call us today for a Camden County, NJ mold inspection. For mold removal and mold inspection Lindenwold, NJ or mold inspection and mold removal Oaklyn, NJ call 1-800-310-3226 to speak with a member of our team.